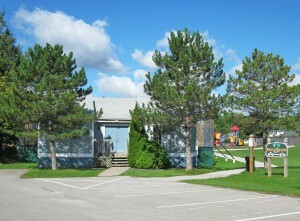 The Fonthill Platform Tennis Club has 2 Courts and a Clubhouse located at the west end of the Pelham Arena Parking Lot at 1120 Haist Street in Fonthill. Conveniently, there is a new Town of Pelham Playground and Swing Set just behind our courts in Rolling Meadows Park. The courts are available for pick-up play and practice by FPTC Adult Members and Families between the hours of 8:00 a.m. and 11:00 p.m. whenever league play and tournament play are not scheduled. The clubhouse may also be reserved for special occasion use by club members. Reservations for courts or the clubhouse may be made through the executive. All members and guests use the Club Facilities at their own risk. The Club is not responsible for personal injury or loss of property however caused. A local person is hired each year to do all of the court shoveling. All other regular maintenance and cleaning is done by member volunteers. Annually, the executive puts together a club-house cleaning schedule. Members will be approached as required to volunteer in helping keep the courts in working order and the clubhouse looking good. This season, the courts were resurfaced in the fall and replacement screens will be installed in the early spring. The surface ‘boards’ will be reinforced to make sure the ball bounces as it should.